We are back from the flower show and spring is less than a month away! It may be hard to believe when looking outside, but keep the faith. It will be here. Are you ready? 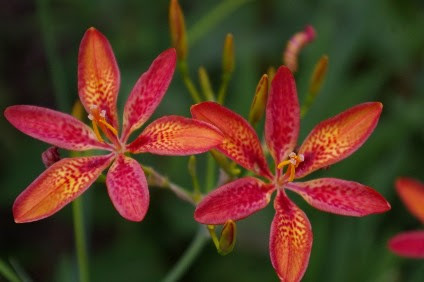 Pardancanda (blackberry lily) is one of my favorite plants. I will be talking about my favorites and those of my staff at Design Day this Saturday. Are you registered yet? This Saturday, we are having our first ever Design Day. 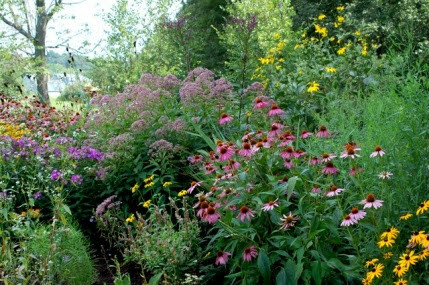 Held down the street at the Zion Episcopal church in North Branford, this all-day event offers 7 mini-workshops on a wide range of garden design topics. You can register on-line or via fax or phone for a mere $40 for an all day pass. Such a bargain for all this information! Walk-ins are welcome! I will be bringing lots of exciting gardening books as well as some assorted seeds that you may want to buy now (breadseed poppies for example). Joining me will be Rebecca Holley, my landscape design assistant, who will be sharing her experiences with a 12 year old plan that needs revision. 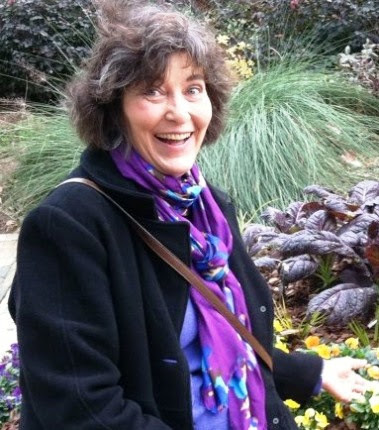 Diane St. John will be explaining how she converted an overgrown part of her property to a wild, native garden (see photo above). I asked all of my employees to choose one favorite plant and explain why they chose it- that will be our Lunch and Learn slideshow. I am preparing talks on succession of bloom and spacing plants, working with small gardens, evergreen structure and creating strong bones in your landscape, and combining plants with color in mind. Whew! What a full day of information, beautiful photographs, and sharing of ideas. I guarantee that you will totally forget about the snow and cold outside for seven hours. Won’t you join us? Learn how to combine plants together to create stunning combinations at Design Day this Saturday. Last weekend I attended a wonderful workshop given by one of my favorite garden writers, Ken Druse. It was all about Natural Companions, the title of a beautiful book that he wrote in collaboration with my friend Ellen Hoverkamp. He inspired me to really think about why we combine plants in certain ways. It may be that they need the same conditions. 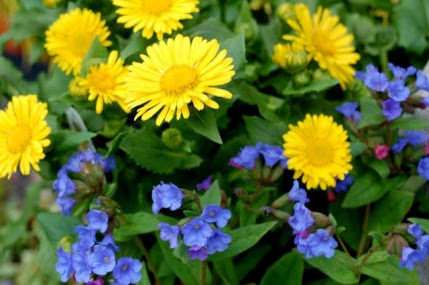 It may be that they bloom at the same time as the Doronicum and Pulmonaria do in the photo above. He discussed the color wheel and what various colors and combinations do for our feelings and our moods. This week I have been deeply studying the new book by Rick Darke and Doug Tallamy entitled Living Landscapes. A few weeks ago I attended a lecture by Jan Johnsen called Heaven is a Garden. I have just finished her book of the same name and gained such knowledge and inspiration from her writings. That is what winter is all about for me and, most likely, you. We can’t go outside and dig in the dirt but we sure can dream and plan and prepare. 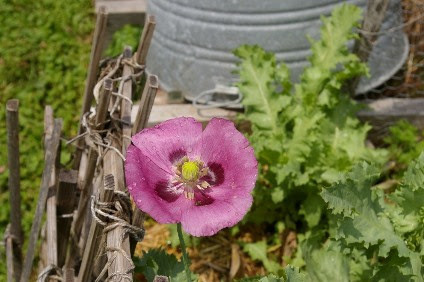 Get ready- the snow WILL melt and you need to sow your breadseed poppies on frozen soil as soon as it reveals itself. We carry lots of kinds, many colors, singles and doubles. I will bring some seeds to Design Day this Saturday so you can be prepared for that magical moment when all this snow melts! The countdown continues on Facebook every day as we patiently await the arrival of spring and the day that Natureworks opens for the 2015 growing season. As of today, spring is only 23 days away! I hope you are following this countdown, it is just so much fun. Diane and I switch back and forth posting our favorite photos and people share them with friends to cheer them up. As our opening day approaches, I am restocking seeds and books as we sold so much at the flower show last week. It was wonderful to see so many happy people immersed in that magical world of spring inside the convention center as winter continued its frustrating dance outside. When I would leave in the evening to get in my car, I felt like I was on the moon. So now my home is filled with fragrant hyacinths and a fresh stock of aromatic, all natural candles, soaps, and creams as a result of my purchases at the show. I will fill another vase with freshly cut ‘Arnold’s Promise’ witch hazel branches as they open in just a few days. This is the first year that I can remember that our witch hazel tree in front of the shop was not in bloom when we returned from the flower show. A warm spell is all it needs to break dormancy and then, we are off to the races once again! I can’t wait. 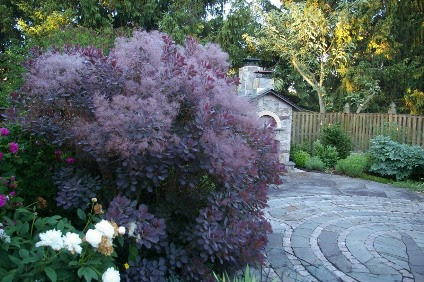 My courtyard with a purple smokebush in bloom. Learn how to create “strong bones’ in your landscape at Design Day this Saturday.